The Woodlands at Furman is a premier senior living community located in Upstate South Carolina, between Greenville and Travelers Rest. This lively, best-in-class community is well-known for its perfect recipe: best-in-class services, luxury amenities and gorgeous location. “One of the best parts of living at The Woodlands at Furman is our fantastic residents. They are incredible people who are living incredible lives. We love that EVG spotlights them and shows them off." While maintaining an outstanding reputation in the skilled nursing and assisted living segments, The Woodlands has also enjoyed success with their independent living apartments, always maintaining a 95% or higher occupancy rate. They wanted alternatives to one-size-fits-all communication strategies. They wanted content that dove deep; content that could tell the story of the community, its residents, staff, and services. Their internal team needed additional bandwidth in order to accomplish these goals, so The Woodlands engaged with EnVeritas Group, a creative content agency that’s making its presence known in the senior living space. EVG met with The Woodlands team in early 2018 to understand the community’s challenges, goals and how they thought the EVG team could help. After initial meetings, EVG’s team formulated a content plan that would move the needle for The Woodlands while keeping their budget in mind. Showcasing “Special” The Woodland’s blog was identified as an underutilized opportunity. EVG recommended focusing on Facebook as (a) a primary distribution channel for new content creation and (b) the easiest, most cost effective way to engage with audience members directly. means to be part of The Woodlands community. platforms via a new content style guide. on their Google My Business and Facebook listings. EVG understands the demands of crafting compelling and engaging content intended for an audience who feels personally invested in a place and its people. Our commitment to storytelling allows The Woodlands to share the ever-changing story of their community. The Woodlands’ leadership team understands the importance of measuring the success of digital efforts. While results are crucial, the leadership team also believes everything they do should put their current and prospective residents first. 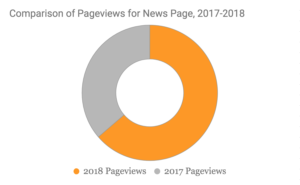 76% over 2017, higher than the site’s overall pageview increase of 43%. Average time on page increased from 56 seconds in 2017 to 1 minute and 47 seconds in 2018, or 90%. In terms of organic search traffic, one of The Woodlands’ best-performing blogs is a piece EVG did on the Villas’ floor plans. Since posting on March 2, 2018, this article has consistently garnered views, and the average time on page is three (3) times higher than the average page on the site. People are consuming the content, which is exactly what The Woodlands wants from their blog. On the social media front, EVG works with The Woodlands to focus on producing Facebook posts focusing on people and encouraging audience engagement. For example, a successful April 27 post contains a link to a blog article on Evan Faucette, a popular Woodlands team member. Thus far, the post has garnered 63 combined likes, shares and comments. EVG also uses Facebook to share current news about the community. An example is an August 3 post acknowledging an award The Woodlands received from a local publication. This post has been liked, shared and commented on 61 times by The Woodlands’ Facebook audience. Total page likes have increased by 21%. 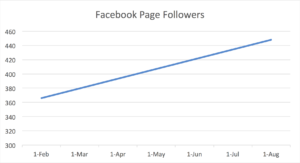 Total page followers have increased by 22%. activities on behalf of the community. content creation efforts about these events. following through on our mission: to provide compelling and engaging content to meet our client’s needs.